Let’s face it, going to jail isn’t something people ever want to experience, which is why Affordable Bail Bonding moves fast to get those who are being detained in Lynchburg jails out. We offer our 24-hour bail bonding services to Lynchburg, VA where we’ll send one of our bondsmen directly to the jail to offer up bail. At Affordable Bail Bonding you’ll get friendly service, free from judgment, no matter what the crime is. Other bail bond companies charge a walking fee, but we don’t. All it takes is 10 percent down on the bond to get you out of jail. 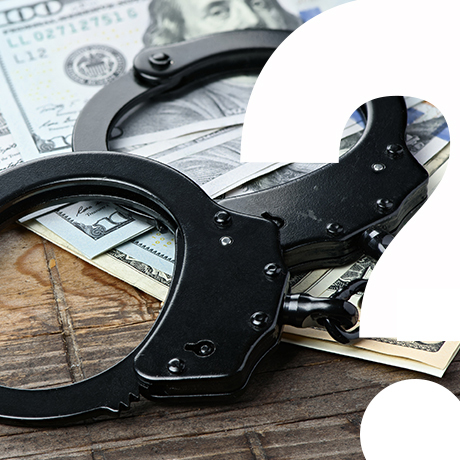 Depending on the crime, full bail or the 10 percent we ask for could be expensive, which is why we offer financing. Affordable Bail Bonding can set up a payment plan for the 10 percent premium required by state law. We’ll work with you to find the best payment option. Our services are customizable and are based on the size of the bail and payment history. Our bondsmen are reliable and friendly to everyone, and you don’t need to worry about your information, we keep that confidential. Affordable Bail Bonding will work with you to ensure that you are able to pay your bond and avoid more time in jail. All it takes is 10 percent to leave jail today. If your bond is $10,000 total, all you need is $1,000. If you don’t have the cash, then we will set up a payment plan. The only thing we ask for is your pledge to appear at your court date and to pay the rest of your bail. Here at Affordable Bail Bonding, we care about helping you get out of jail. No matter if it’s for you or someone else, we act fast at an affordable price. You can rely on us to pick you up from any Lynchburg jail with our 24-hour bail bonding services. The city of Lynchburg is known for a lot of things that make it a very special place to live. On the other hand, the City of Seven Hills also just happens to be growing, which means more people. We have found that the larger the city, the more often we are getting phone calls to come help liberate people from behind bars in the Lynchburg jail. If you find that a decision you have made has landed you in a bit of trouble with the law, it’s unlikely that you want to remain in the jail for any amount of time at all. Lucky for you, this is where Affordable Bail Bonding comes in. Continue reading below to learn more about how we can help you if you ever find yourself in the Lynchburg jail. We’re going to be completely honest, ending up in jail isn’t the ideal night (or morning in some cases) for any person. However, as humans, it is expected that we will make mistakes from time to time. Maybe you had too much to drink and did something out of character, maybe you found yourself in a desperate situation and you thought you had to do something that you now regret. Whatever it is that has landed you behind bars, there is no need to feel ashamed. As bail bondsman in Virginia, we have seen basically every charge in the book. This means that when you call us, there is likely nothing you can tell us that we haven’t heard before. On the bright side, this means we know precisely how to handle your situation as we have likely dealt with it before. But what if it the first time you have ever been arrested? Are you prepared to handle this predicament? With the help of Affordable Bail Bonding, we guarantee you will be! Plain and simple, there are several different ways by which you can be released from jail after you have been arrested. The first of these is to post cash for the full amount of the bond with the court or jail. The second is that you can use any real estate you may own as collateral with the court. The third is that the judge can decide to let you go free on your own recognizance until you have to appear in court again. And that last is that you can enlist the help of a bail bondsman. 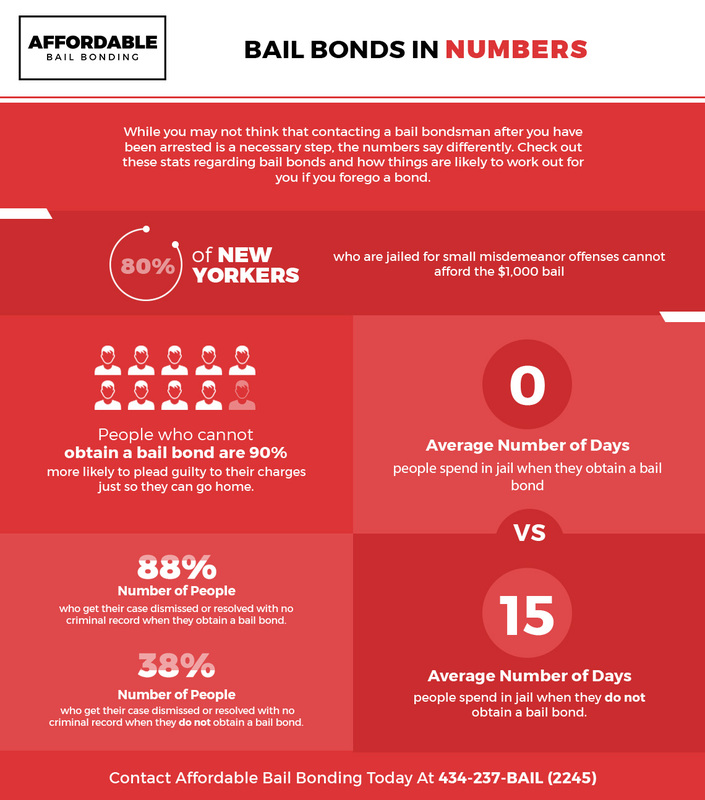 Since the majority of defendants cannot raise the full amount of their bail, turning to a bondsman for help is an optimal choice when they find themselves in jail. But what is a bail bondsman? In the simplest terms, a bail bondsman is someone who works for a bond company. This is the person who shows up at the jail and posts a portion of your bail for you so that you can be released. The bondsman is essentially pledging a certain amount of money (the bond amount) to ensure that you will show up in court to answer for what you are being charged with. How Can A Lynchburg Bail Bondsman Help You? Once you decide you want to hire a Lynchburg bail bondsman, the first thing you need to do is give Affordable Bail Bonding. After initial contact, this is when the real process begins. You will first discuss the pricing options that are available to you with the bail agent. This means that there will be a set fee that you are required to pay to said agent. The bondsman will then provide the court with a surety bond that will allow for you, the defendant, to be released. So long as you show up for your court date, and don’t miss any court dates in the future, you won’t have to pay any money to the bondsman. It is important to know, on the other hand, that if you are not able to appear at your court date, you will be considered to be “skipping bail”. This means that the bail is then surrendered or forfeited. In cases like this, the bondsman will then have the authority to find the location of the defendant and surrender him or her to the court. Additionally, if any friends or family members of the defendant co-signed the bail bond will be held responsible for the bond amount. If you happened to use some sort of collateral, such as your home, you may even face foreclosure after skipping bail. You will also need to let the bondsman know how much the bail has been set at. While they are capable of looking it up on their own, if you want to process to be a speedy one, it’s best to give as much information as you can upfront. Once the bondsman knows this amount, they can then let you know how much you are going to need in order to get their help. We pride ourselves on being a reliable and trustworthy source for bail bonds in Lynchburg. However, while we know that our bail bondsmen only have your best interest in mind, there are other bond companies out there that take advantage of people in this vulnerable position. Seeing a friend or family member get arrested can often be a quite traumatic experience. This heightened state of emotions is often the cause of someone making a rash decision concerning which bail bond company they should use. This is often when scam-artists are there to take advantage of the situation. Be very wary when dealing with people who claim to be bail bondsman unless you are able to verify that they are actually legitimate. A great rule of thumb is to always avoid people who solicit outside of jails or in jail lobbies. This is not how a professional bail bond company operates its business and therefore should be a gigantic red flag to you that something isn’t right. Additionally, if you are solicited by a bail bondsman who you have not already contacted directly, avoid working with them. This practice is not only prohibited, but it is also a sign that something is not on the up and up. We know that things happen in life that you cannot possibly plan for. However, that is precisely why we do what do for those residents of Lynchburg. When you contact Affordable Bail Bonding, you can be sure that our team will work as quickly as possible to ensure that you or your loved one is released in a timely manner. It is important to us that you know that we truly care about your comfort and overall well-being, which is why we work so hard to solve your issue in no time at all. It is also important to know that Affordable Bail Bonding is open 24 hours a day, 7 days a week. This means there is no time you can find yourself in a predicament during which we won’t be able to help you. We think people like knowing that we are around day or night to offer them the help and support they need when they are arrested. If you or a loved one has been arrested and you need help getting them out of jail, don’t wait another minute to call Affordable Bail Bonding in Lynchburg, Virginia. We would be happy to help you during this difficult time.